As researchers, we have found that writing can change perspectives that shape teaching practice. 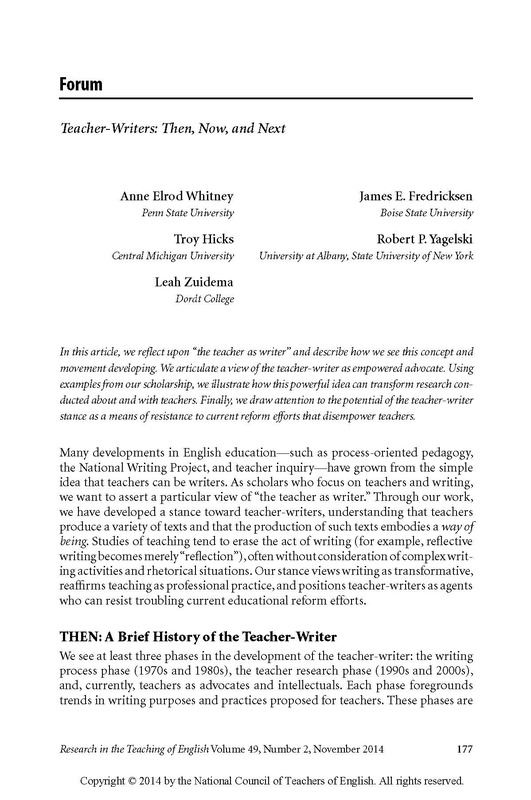 For example, NWP writing groups and peer feedback have fomented teacher transformation (Whitney, 2008), and personal and professional writing helped NWP teachers claim identities as writers and make concomitant shifts in teaching practices (Whitney, 2009b). Yet in a culture where teachers are attacked from the outside and sometimes gloss over ‘messy’ classroom moments from within (Bush, 2000), teacher-writers sometimes feel daunted by the threat of criticism. Our studies suggest that when teachers write for colleagues, they position themselves within the larger arguments they want to make about what it means to teach (and teach well) (Fredricksen, 2008; Zuidema, 2012). The complex rhetorical and political contexts teacher-writers navigate yield links between authoring and authority (Whitney, Zuidema, & Fredricksen, 2014). […] We see teacher-writers being authors in every sense: professionals who claim authority with their own words and their work.